amazing DIY headband maker kit is the most complete baby shower games party supplies DIY headband station on the marke;Now you have a premium quality kit that contains everything you need to get started! This DIY Headband Kit is Full of Quality Party Supplies and Has BEEN LOVED By Anyone Who Has Ever Used It As Their Baby Shower Games Activity. √ INCOMPARABLE QUALITY: each party headband supplies kit is created upon the highest quality standards and designed to exceed your highest expectations! 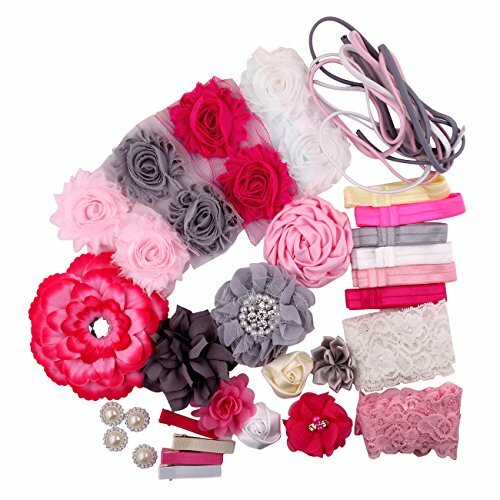 √ A WIDE VARIETY OF BABY SHOWER GAMES ACCESSORIES AT THE MOST ECONOMICAL PRICE: Each baby shower games headband kit is full of ribbons, bows, flowers and jewels along with elastic bands. √ TOTALLY ADORABLE, custom made headbands to fit all your preferences and style needs! √ IT WILL BECOME A BABY SHOWER PARTY HIT: Have fun making the most beautiful headbands with the most complete headband party supplies making station, the perfect blend of fun and practicality - A great activity idea for birthday parties, girls' days and baby shower games ideas! Manufacturer: Yiwu Omer Accessories Co., Ltd. Publisher: Yiwu Omer Accessories Co., Ltd. Studio: Yiwu Omer Accessories Co., Ltd. If you have any questions about this product by Candygirl, contact us by completing and submitting the form below. If you are looking for a specif part number, please include it with your message.